Indian Embrace is starting to develop into an intricate Varanasi sari. My character, Pamela Grenvel is a New York styled, business guru whose harsh brash (but lovable) tones vibrate on the baking Indian Bizarre. Whether it is business deals, family bonding or Pavlova coaching, her heart is set on perfection and she will stop at nothing to achieve this. But will the intoxication of the Ganges even knock Pamela of her well- planned perch? A message from the director! Rehearsals are well underway and the cast are enthusiastically embracing the script as they delve into the inner thoughts of their characters. I feel so privileged to be the first director working with Carol’s wonderful script! Carol is very open to subtle changes of dialogue that don’t hamper the progression of the storyline. In fact, she is usually delighted at the words that are literally “coming out of the mouths” of the actors as they discover their characters. It is certainly a thrill to be able to liaise so directly with the writer and to tap her thoughts whilst simultaneously exploring my own vision of the play. I have a production meeting with Richard Neville tomorrow. He has some very imaginative and exciting ideas about enhancing the set design with lighting. It is such a joyful process, bringing this beautiful story to life! My meeting with Richard was a great success. He has brilliantly combined my thoughts and concepts into an imaginative set that will powerfully evoke the sights and colours of India. I first met Lenore Robertson and Carol Dance in 2012 when I was cast as Vikram Singh in Roopa’s Goal, a play staged in the S+S Theatre Festival Sydney. The play explored various themes of migration in particular it highlighted whether the bitter sweet pain of migration- of leaving behind one’s birth place for the promise of greener pastures in their adopted homeland. Is really worth it in the end? Having worked with Lenore and Carol, I realised that we are bound by a common interest in cross-cultural story telling. Carol’s migration to Australia from her homeland of USA provided some of the inspiration for her writings. Lenore has a particular passion for working with cross- cultural themes and my own migration from India provided me the insight and first hand experience of synthesising the culture of my birth place with my adopted homeland. Having worked closely in Roopa’s Goal, an abridged version of the play, Indian Embrace sowed the seeds for us to come together again in bringing to our audiences for a season- long showcasing of the full length play.With a matured casting list and a professional support team behind her, Lenore has taken a firm hold of the reins as Indian Embrace’s director. She has challenged the actors to authenticate the characterisation of their roles pushing the boundaries to bring to life on stage a story which will hold universal appeal to the audience. 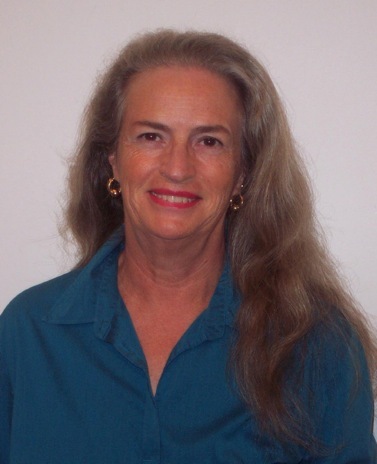 Lenore’s easy going style and down- to- earth personality is an asset to her directional ability. The presentation of the play will be intimate yet experimental. In this premiere performance, this beautiful story, with its underlying themes of migration, co-existence and sustainability of culture will be depicted in a very meaningful context. The comic elements present in this play will leave an indelible mark on you. The story is timely, contemporary yet not clichéd. 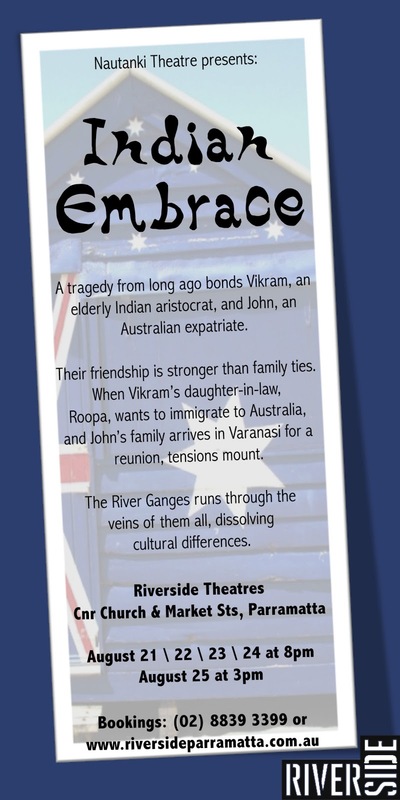 Indian Embrace’s fun filled scenes are well balanced with the dramatic elements that Carol has written. As an independent theatre production Nautanki Theatre’s endeavour of Indian Embrace must be watched, experienced, relished and reflected upon. We look forward to entertaining you. We can now reveal Nautanki Theatre's amazing line up of cast and creatives for Indian Embrace opening August 21 at the Riverside in Parramatta. The cast: Ambika Asthana, Neel Banerjee, Shashidar Dandekar, James Herrington, Steven Menteith and Lucy Rasheed. Creatives: Director Lenore Robertson, Costumes Pam Legge, Lighting design Richard Neville. Like many travellers, I became fascinated by Varanasi, India, the first time I went there. Also known as Banaras and as Kashi, it is believed to be the oldest continuously inhabited city in the world. I set about writing the play on the plane back to Australia. In 2012 I converted just one scene for a Short and Sweet Ten Play Festival entry and got in the Sydney and the Chennai, India, Festivals. Comments from the Sydney show were: "Carol Dance has written with much wisdom and insight. Carol's writing about the Indian ethos is discerning and perceptive" Preeti Thadani, India Link. Then Nautanki Theatre decided to produce the full-length play. 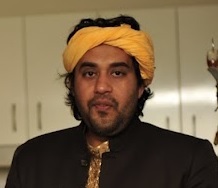 Indian Embrace engages both Indian-Australians and all Australians. The River Ganges runs through the story as three Australians and three Indians in the ancient city face danger together. And, wow, do they bond! Universal emotions subjugate cultural differences. There are many comic, tragic and amazing twists and turns and we're not going to spoil it by telling you any more. There are five performances so be fast to book. Welcome to Nautanki Theatre's blog about our upcoming production of Indian Embrace, a play set in Varanasi, India, by Carol Dance. Carol wrote the play after a trip to Varanasi where she was bowled over by the energy of this famous city. Later, she re-worked one scene of the play for a Short and Sweet entry and got into both S+S Sydney and S+S Chennai (that's in INDIA!). Nautanki then read Carol's full-length play and loved it so much they just had to mount a full production. Nautanki is proud to announce that director Lenore Robertson has selected an excellent cast. Rehearsals have started and the show opens August 21 at the Riverside Theatre in Parramatta. We're not going to give too much away but we can tell you that there is humour, drama, suspense and epiphanies as three Aussies and three Indians face danger together. The mighty Ganges runs through the veins of them all. 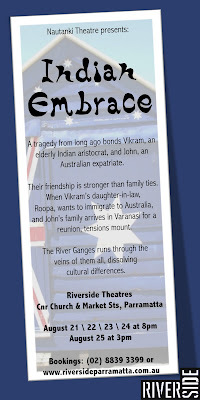 Keep checking our FB page about Indian Embrace for photos of the cast, news updates and our You Tube trailer.